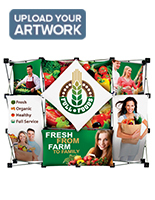 Tradeshow fixtures are lightweight, making transport an effortless task. Concave displays create curiousity surrounding a displayed promotion. 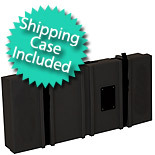 Provided case protects items when not being used at a tradeshow. 46-1/2" tall displays are ideally meant for use on top of a counter. Tubular frame sets up quickly, without any additional tools needed. This table top custom display stand is sized for tabletop usage, yet offer a uniquely styled way to incorporate graphics into a presentation. 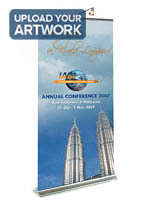 The portable banner stands measure 62" x 46.5" and feature a curved design. 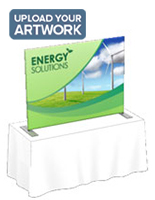 The table top custom display stand will therefore fit perfectly on top of a 6-foot-long table. These table top fixtures are perfect for those traveling in between events, due to the knockdown design. The table top custom display stands are even equipped with a shipping container to keep supplies protected during travel. The portable exhibit booths set up in minutes. Simply attach each pole using the snap-button system. Table top custom display stands, also known as pop-up accessories, are needed to add intrigue and excitement to an exhibit. 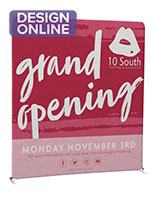 These pop-up booths will draw in crowds while showcasing your advertisements effectively. 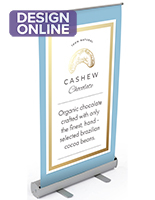 This table top custom display stand is sold with custom-printed graphics included. The fabric artwork slides over top of the framing and zippers closed to remain in place. 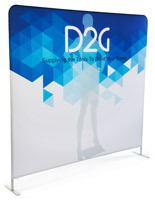 The trade show displays are created through a dye-sublimation printing process. The printed resolution is 600 DPI. 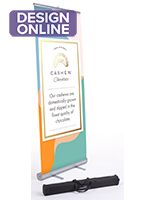 These tabletop banner stands differ from most presentational accessories because of the curved setup and rear leg. 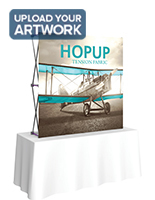 The table top custom display stand enhances an exhibit with personalized artwork that's both affordable and easy to install. 34.0" x 7.0" x 15.0"